The remnants of a supernova explosion in a neighboring galaxy. Image: ESO/NASA, ESA and the Hubble Heritage Team (STScI/AURA)/F. Vogt et al. There’s something hiding in the center of the red ring in this colorful circle of gas and dust. But it’s only hiding if you don’t know how to look for it. In fact, at the center if this image is a tiny neutron star that is spewing out x-rays. You’re looking at 1E 0102.2-7219, the remnants of a supernova in one our Milky Way’s closest neighbors, the Small Magellanic Cloud dwarf galaxy. This supernova remnant is especially well-studied, but that hasn’t stopped astronomers from continuing to find new surprises, like the neutron star at its center. “It shows how new instrumentation can really open up new avenues of discovery,” study author Elizabeth Bartlett from the European Southern Observatory told Gizmodo. Neutron stars are tiny, super-dense objects that emit x-rays. They can pack the mass of our Sun and more into ball less than 20 miles across. They are so dense, in fact, that the protons and electrons of their atoms are smashed together, forming neutrons—hence the name. If you’ve been reading Gizmodo recently, you’ve probably already figured out that, no, 1E 0102.2-7219 would not look that colorful if you pointed your own telescope at it. 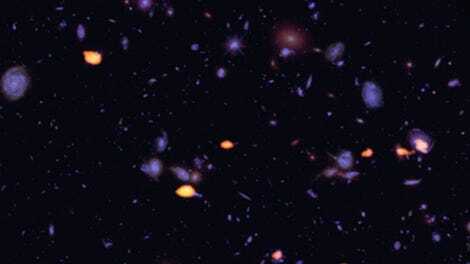 Astronomers have combined data from several telescopes. They’ve chosen to represent the Chandra X-ray Observatory data in purple and blue, but the more interesting stuff is the green and red ring. The ring comes from MUSE instrument attached to the Very Large Telescope, and it’s caused by light emitted from oxygen and neon atoms. That light really would look green and red to your eyes if the supernova remnant were close by. 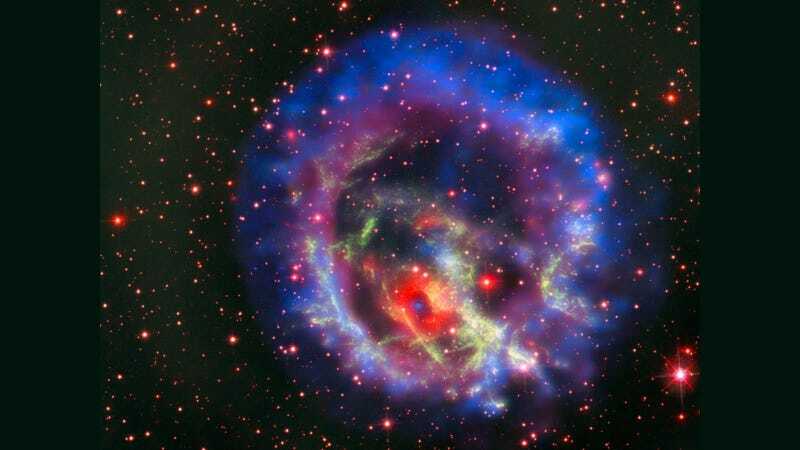 But this ring, along with the x-ray dot in the center, demonstrates the presence of a neutron star just 5.4 miles (8.7 kilometers) in diameter. Given the 200,000 light-year distance between Earth and the Small Magellanic Cloud, it’s one of the furthest such sources ever spotted. Chandra image of the x-ray source (the central blue speck). On top of that, the discovery might be game changing—the authors propose the location as where the supernova began, according to the paper published in Nature Astronomy. Or maybe the compact star was there before the supernova occurred—we don’t know yet. Bartlett just thought it was cool that this thing was hiding in such a well-known source.